Posted April 4, 2006 in 2006/04, 7 Freelance, Archie, Artists, Burgos, Carl, Periods, z Archive. In 1959 Joe produced The Adventures of the Fly for Archie Comics. It was based on the Silver Spider, a never published Simon & Kirby creation. Jack was involved in some of the art, in particular the origin story. But other artists also did work on the Fly comics. Joe’s involvement on the Fly only lasted 4 issues. 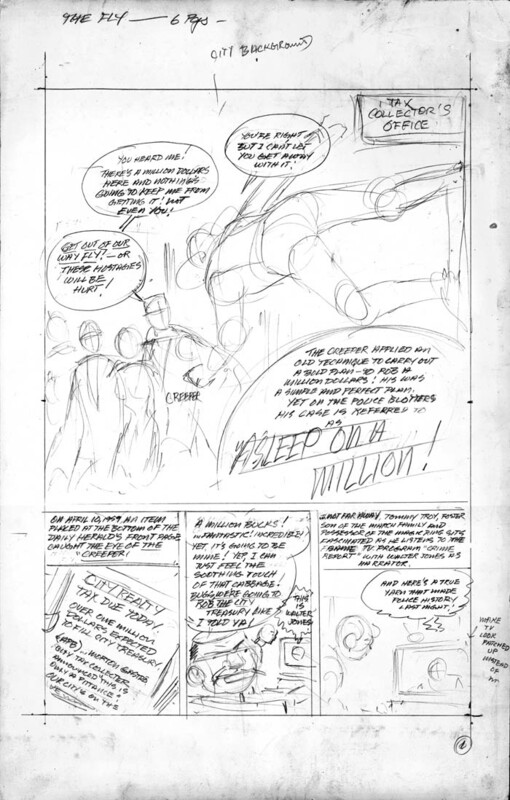 Perhaps that end came suddenly because Joe still has layouts for a Fly story (“Asleep on a Million”). When I asked him about them, he said that they were done by Carl Burgos. I was aware that Joe knew Carl well, but I did not know that Burgos had anything to do with the Fly. Need I add that Carl was the creator and frequent artist of the Human Torch for Timely. There is a larger image here. In the top margin of the first page is a note: “The Fly – 6 pgs”. But Joe only has 4 pages. They were all in the same envelope so I don’t think the missing 2 pages were misplaced. I suspect that they were never actually done. The art work for the layouts are very rough and done in light pencil. The script is in stronger pencil but still rough. However the script text itself looks like the it was meant to be the final draft. There are also margin notes providing directions such as “city background” for the splash. Or “make TV look patched up instead of new” for panel 4. One note makes it obvious that these layouts were meant for another to finish (“artist add crime graf behind news caster”). Having seen this one layout, it makes you wonder whether Carl Burgos may have made some of the layouts for some of the Fly stories that were published. It also makes you curious about why he was not going to do the finishing pencils himself.